Grill Master Craig Held and Jane Shriner of team "Dog Gone Good Eats" prepared lamb sliders with mint tzatziki sauce on Hawaiian rolls for the Inaugural âChurchstockâ grill off and RV show. EDWARDS — It seems like there will always be the challenge to come up with fresh, new ideas to have fun while fundraising. The Edwards Interfaith Chapel and Community Center congregation did just that with Churchstock this past week in their parking lot. When I told former Vail Daily Arts & Entertainment Editor Caramie Schnell about Churchstock, she said, “Wait! What?” It was funny because in all the years that I have known Caramie, she has never seemed phased by any new idea that I shared. Now this was unique, and she could get behind the idea of a mini church version of Woodstock. What is Churchstock you ask? Well, it’s a combination of great grilled food, an RV home tour, community togethereness, games and music, too. At high noon on July 18, the Rev. Keith Brooks and Pastor Mark blessed the six RV homes gracing the upper lanes of the Interfaith Chapel parking lot. Then guests had the opportunity to tour the RV Homes. And, thanks to Bev and Don Barnes, Lora and Scott Green, Siggy and Doug Gray, Debbie and Pat Horvath, Robin and Steve Rudy and Linda and Tom Tasillo, folks had some mighty fine RV homes to tour. After the RV home tour, everyone enjoyed spectacular samplings from six extraordinary grill chefs. Under the direction of grill master and chef Jim Bittner, grill chefs Steve Baird, Fr. Brooks, Linda and Bob Egan, Jane and Ed Shriner, Larry Trotter, Skip Kinsley and Mike Williams, Cathy and Woody Mann and Kathy Bellamy prepared dishes that delighted the attendees. These chefs and their able assistants stayed busy creating their grilled specialties while guests mingled and toured the RVs. 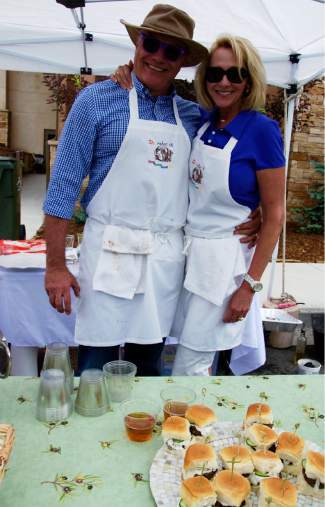 Brainchild of Jim Bittner and Linda Egan, this event was the epitome of Taste of Vail quality grilled meat and beer pairings, along with some fine wines donated by Beverly and Don Barnes of Eagle Liquor Mart. And, the dessert tent featured mint truffles prepared by Sandi Kinsley, Debbie Horvath and Alex Garbacz; chocolate-covered strawberries prepared by Karin Hoglund and Helen Beckwith; and paired with Champagne courtesy of Paul and Carole Lelena. This event was about friends and family gathering together in the out doors akin to RV camping, but in an Interfaith Chapel parking lot. The set up even survived a monsoon type microburst of weather including high winds that wrestled with the tents. Luckily, it passed with little to no damage to equipment or anyone’s spirit. Here’s to a second annual Churchstock in the future. Betty Ann Woodland is a longtime local who covers social events of all kinds including fundraisers for non-profits, local happenings and soirees of all kinds.